My four-year old son, John, is now officially LEGO-obsessed. I’m thinking ahead for our future travels and researching LEGO Travel Toys. Here are some great ones I’ve found. Do you have any LEGO Travel Toys to add that have been winners for you? Share in the comments below! 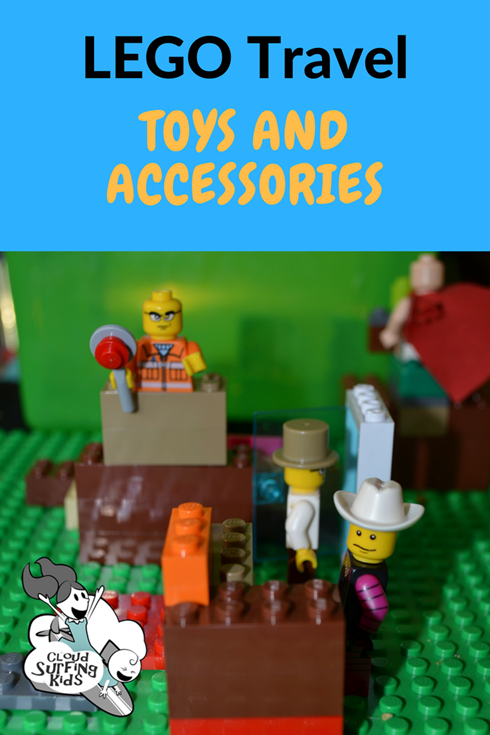 If you’re a blogger and have a post about LEGO Travel Toys too, feel free to a link to your post! This is something I’ll definitely try. I think instead of a lunch box I’ll use a small pencil box. This is because most of the time we will be using it for airplane travel, and a pencil box is smaller in size and easier to fit in our travel bag. If we were doing more road trips, I would opt for the larger box. If you look on Pinterest, there are many websites that share how to make these. Here is one with easy-to-follow steps from hip2save. If you do want to use a lunch box for this project, here’s one with a LEGO theme: LEGO City Nights Lunchbox. If you’re like me, and don’t even want to mess with a glue gun, get these self-adhesive base plates! You’ll still need to cut them to size, but this looks so easy to just peel and stick! With 83 pieces, this should keep your child occupied in building for a while. Then they have a couple great toys to play with: Two figures and two vehicles. What better thing to build on a plane than a plane!?! This would be fun to build and play with. My son loves opening these little blind bags. They come with just one Lego Minifigure. These would be great to pull out of your bag to add some excitement when your child really starts to get bored in flight. In my searching, I thought it would be fun in the weeks before a flight to build up enthusiasm with a LEGO Airport! This is the only one I found that isn’t discontinued. 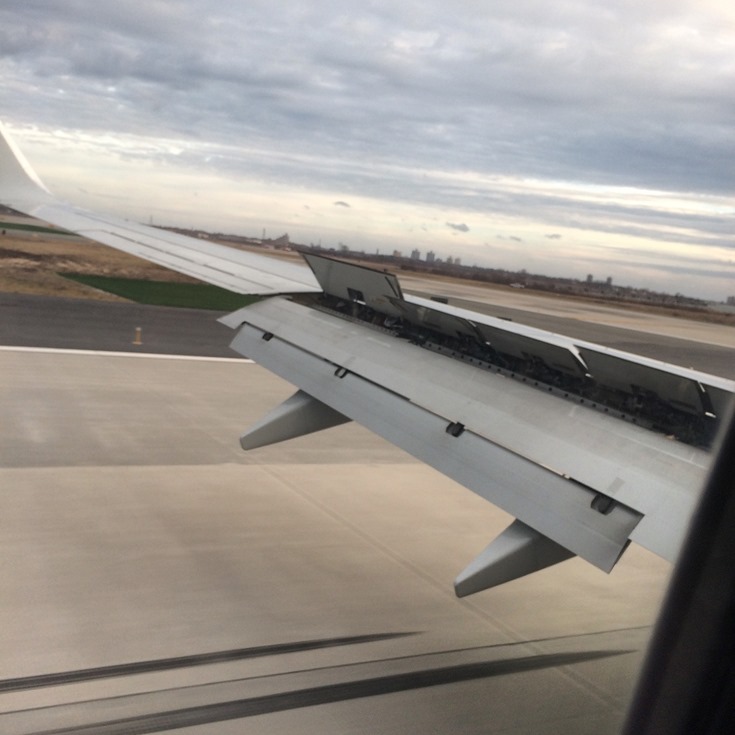 I love the airplane with the rolling ramp stand for boarding! I like to pack mini flashlights in our travel busy bag. It can literally brighten a kid’s day during a flight delay on a late night. This LEGO Ninjago Key Light is fun, because it can be used as a both a toy and a light. I like to pack books for flights, but I always choose carefully to make sure I’m not just adding weight to our busy bag. This LEGO City book looks good for a thin and lightweight option. Pack this airport-themed book for your LEGO-loving child! My kids, at ages 9 and 4, are finally old enough that we can consider taking carry-on luggage and not checking our bags. (It’s just much simpler when they are small to check bags and bring backpacks only on the flight.) I’m thinking about getting this LEGO Batman Rolling Suitcase for my four-year-old John sometime this year. I think he would love it! You can find a good variety of LEGO Luggage Tags, but I’m loving this LEGO Mariachi Batman. So funny!!! Always bring a small blanket or shawl for yourself and for the kids when you travel. 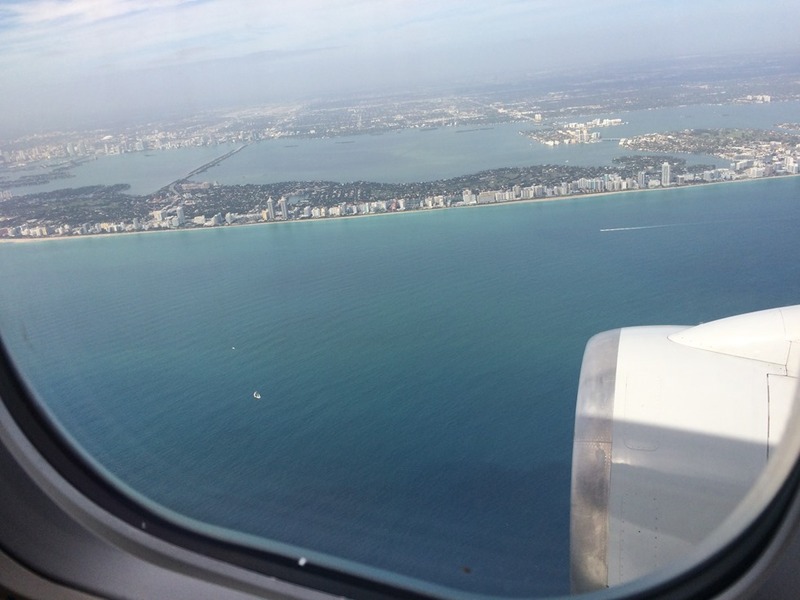 This post tells five things I always pack, even if I expect the airline to provide them. A blanket is one of the five. 5 Things You Should Always Pack (Even If the Airline Provides Them). Wouldn’t it be so much fun to stay at this LEGO house? Check out this review from TravelingMom. Okay, I think that is enough LEGO for now! It’s pretty fun looking for a theme for your busy bag. I never really tried it before. Have you ever done a themed busy bag? Do you have any fun LEGO travel ideas to add? Comment below or on our Facebook, Instagram, or Twitter pages. “Not everyone with autism has the same symptoms. [People with autism] probably aren’t good at listening to boring things. *This post contains affiliate links. If you make a purchase through these links, I may receive a small commission, which will go toward the operation costs of this site. Thank you for your support! -Beth H.
Some people with autism have difficulty breaking from routine. Facing unexpected events in the day put them in defensive mode and can add to stress and anxiety which could result in a meltdown. It can help to discuss what to expect in the travel day, to make a list or chart, and to include potential interruptions (such as delays, turbulence, etc.) so that they can be mentally prepared. Of course you know your child best. If discussing things before hand actually adds to the anxiety, don’t do it. “I know with my son any outing goes more smoothly if he has an idea of what to expect. 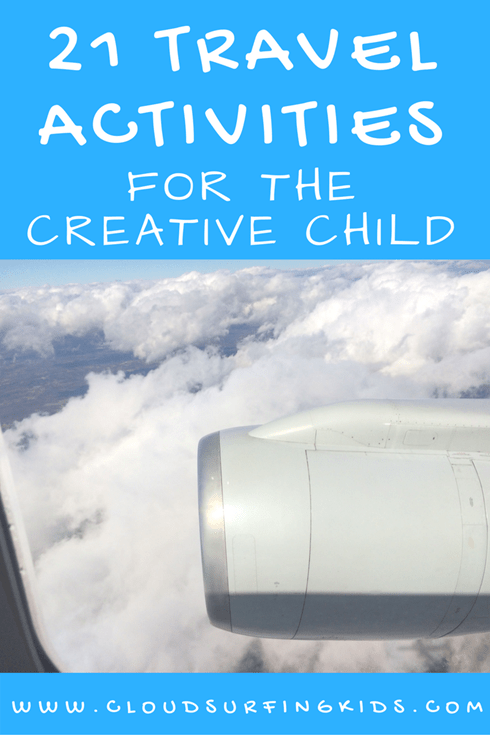 This is especially true if your child has never been to an airport!” –Kim C.
One of the best ways to help your child manage their travel day is by incorporating “heavy work” (also known as proprioceptive input). 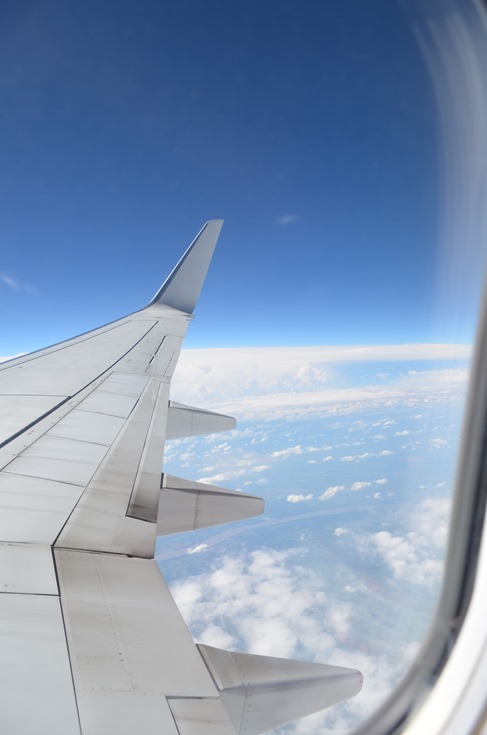 Here are some easy ways to add “heavy work” to your travel day. Again, these ideas are useful for any child, with or without a diagnosis (as long as they are not the type to become overwhelmed by this—you know your child). Use a blanket as a privacy shield. In the terminal you may be able to find a family restroom or a quiet corner away from the gates where your child can take a few minutes to be away from some of the noise and crowd. For younger children, an umbrella stroller with a canopy may be helpful. If your child has difficulty in regulating emotions, the last thing you need is added irritability due to hunger. Don’t depend on the airline to provide something your child will like. Even if food is scheduled to be served, it may not be to your child’s liking, there may be a problem with catering, or delays or turbulence may prevent the food from being served. I always pack a small cooler of many snacks that are tried and true. Here are a few posts that tell about our favorite travel food items: Fun Travel Food Ideas & Tools. “It’s absolutely better to know in advance. I feel like they are more attention-seeking if they wait until a situation flares up and it gets out of hand.” –Sean P.
“…it would be nice to know in advance to diffuse anything and help the parents out any way possible. Many of our passengers may not be very educated with different sensory issues and they might assume something [threatening] is happening [when] that is not the situation.” –Matthew P.
“…Please tell me so if there is a meltdown I know how to handle it…If we know [then] we can [also] help the family for their privacy. 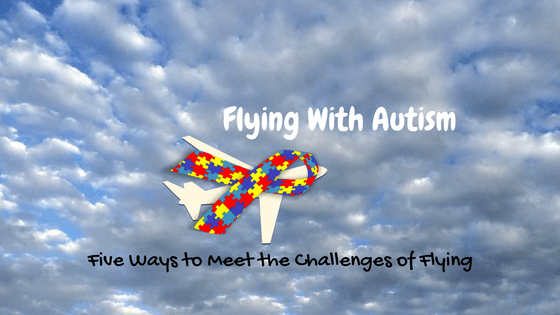 So they won’t be judged [by other passengers].” –Sofia H.
The challenges of flying with autism can be tough, but these tips are designed to help you be prepared and hopefully avoid preventable meltdowns. 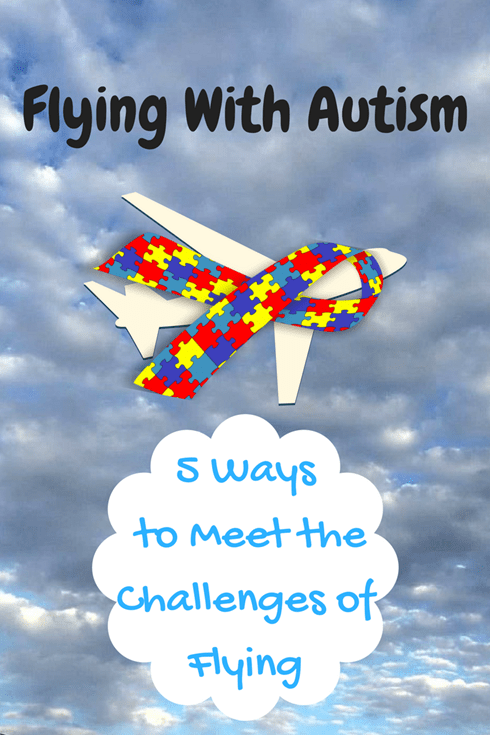 Do you have a child with autism? What other ideas can you add to help our readers? Comment below or on our Facebook, Twitter, or Instagram page. Questions about Flying With Kids? 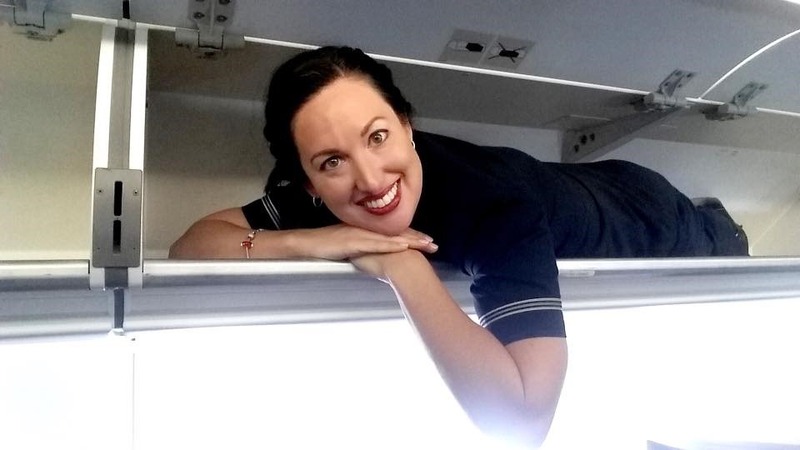 Ask a Flight Attendant Mom! I put this question up on my personal Facebook page, and I want to expand it to the rest of you! I’m a 17 year flight attendant for a major airline, a mom of two kids, ages 9 and 4, who have been on over 150 flights combined. My oldest has sensory issues and my youngest is a little wild! What questions about family travel or flying with kids do you have for me? Here are some questions that have been asked so far. I’ll answer them in more detail in future blog posts. Picky eaters on a long flight. What advice do you have (not including iPad or computer) for a 16 hour flight to Dubai with kids?!?! I can definitely write a full post on that! And I will–but the first two things that pop into my head are not using headsets with audio entertainment and not picking up after yourself (or at least attempting to). I’ll write more on it, but distraction is what works best for my kids. Lollipops, fruit chews, chocolates, and a mini bubble wand. Plus explaining to them what’s happening and that it will get better. 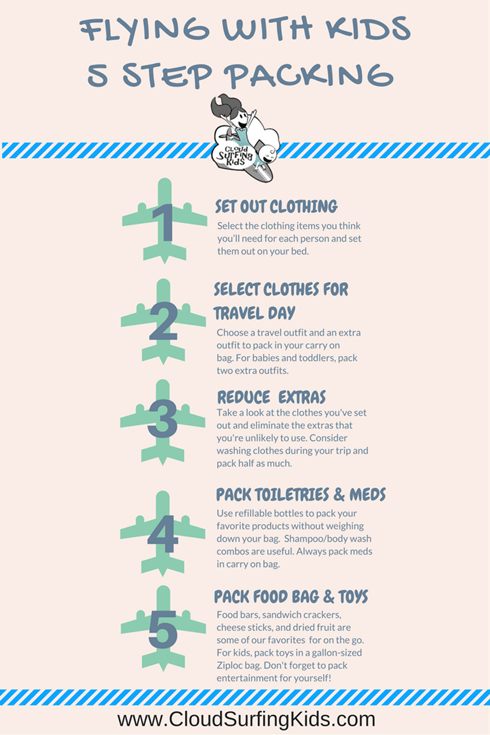 Here is a post on some things to pack to help prevent ear pain for kids: Things to Pack for Flying With a Cold. For liquid food it’s usually best to buy in the airport. Sizes have to be 3.4 oz or less and fit in a quart-sized Ziploc bag to take through security. But you can bring anything on the plane which you purchase once past the security checkpoint. Here’s a post I wrote on what food you can bring on the plane: Food on the Plane: What Can I Bring? I haven’t taken my kids on a long-haul flight yet, but I’ve had a 5 hour scheduled flight turn into 11 hours on the plane! I would still pack the same way for the 16 hour flight. I pack lots of travel toys but keep them fitting in a gallon-size Ziploc bag. Definitely bring a blanket (the kids -sized micro-plush blankets roll up small enough to shove in a grocery tote bag–I use the Trader Joe’s freezer bag tote for this). 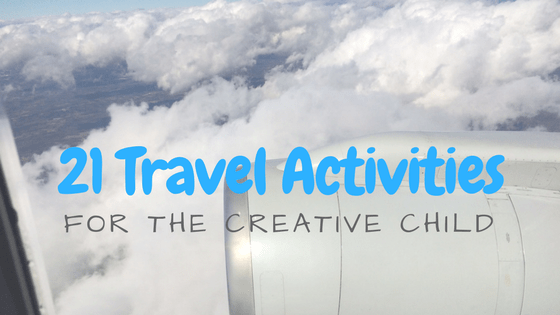 Here are some ideas for creative activities that would suit the age of your children (7 and 8 in this case) : Best Travel Activities For the Creative Child. What questions do you have for me? I’ll do my best to answer or direct you to an answer from another family travel blogger if it’s outside of my experience. Leave a comment below, or on our Facebook, Instagram, or Twitter page. I’m always on the look out for good toys and activities for travel. 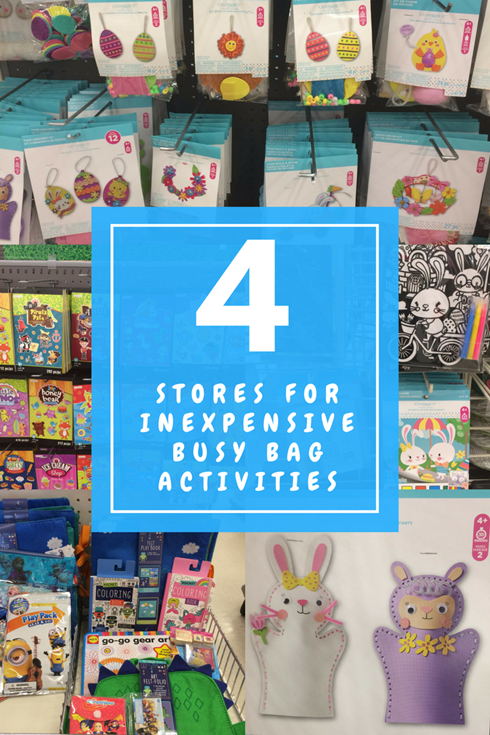 These four stores are where I find the inexpensive busy bag toys and activities that the kids and I like best. Do you have inexpensive busy bag items to add? Where did you find them? Help our readers out and comment below! The Dollar Spot is always worth checking out for simple travel toys. 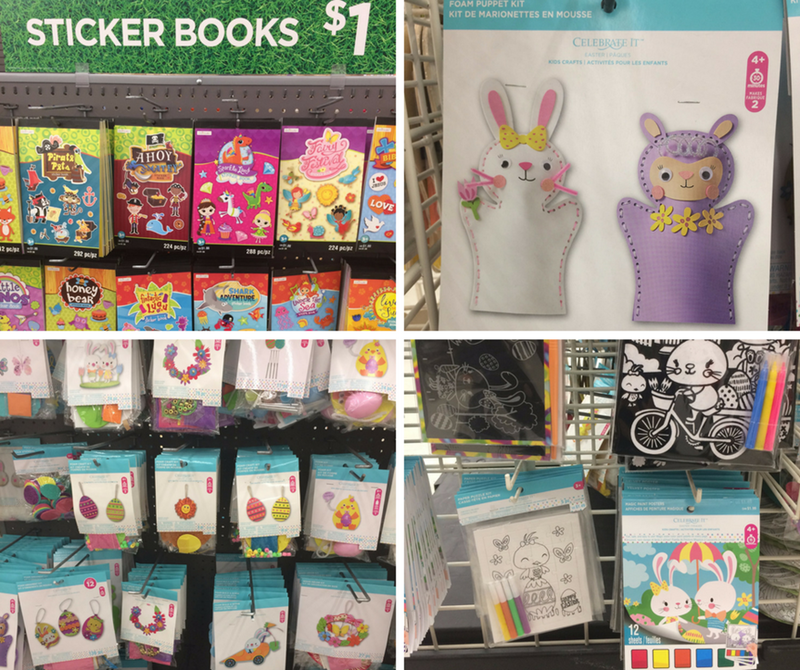 You can often find mini books, coloring books, magnetic games, or card games there. Usually the more useful things are $3- $5 instead of $1. 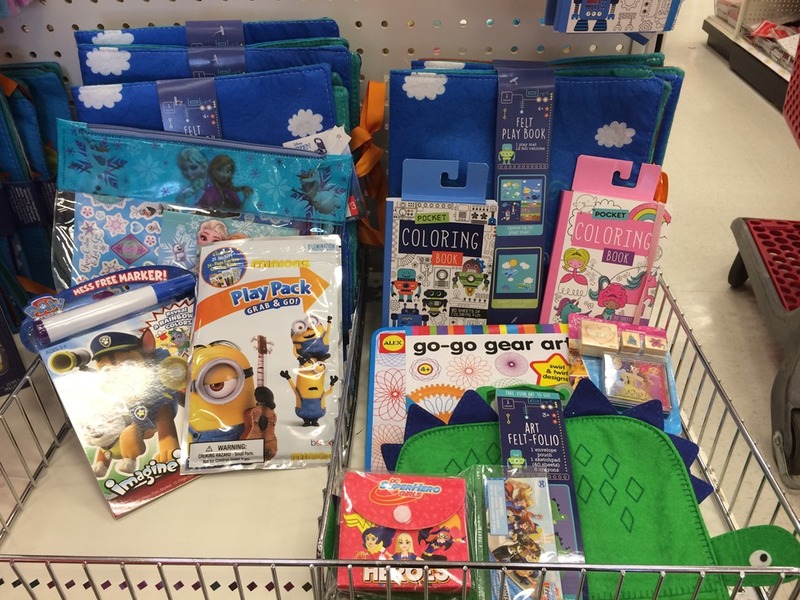 I find lots of good prices on toys and books at Marshalls. Recently I have seen Play-Doh travel packs, Melissa & Doug travel activities, action figures, and art kits there, all below retail prices. You may notice I don’t mention the Dollar Store. I’m sure you can find good deals there, but I am not a fan of Dollar Stores. The reason is I can usually find better quality and similar prices at the places mentioned above. I don’t really want to buy “junk” toys, just because they are cheap. There are people who are experts at finding good quality and great deals at Dollar Stores, but it’s not something I want to spend my time on. If it works for you, though, go ahead browse the aisles and see what you find! I try to publish a new blog post every Tuesday with tips for travel (although lately it’s been every other week). Be sure to follow us on Facebook, Twitter, or Instagram for updates on new blog posts. Have a question for me about travel? Ask below or on social media and I’ll do my best to get you the answer. 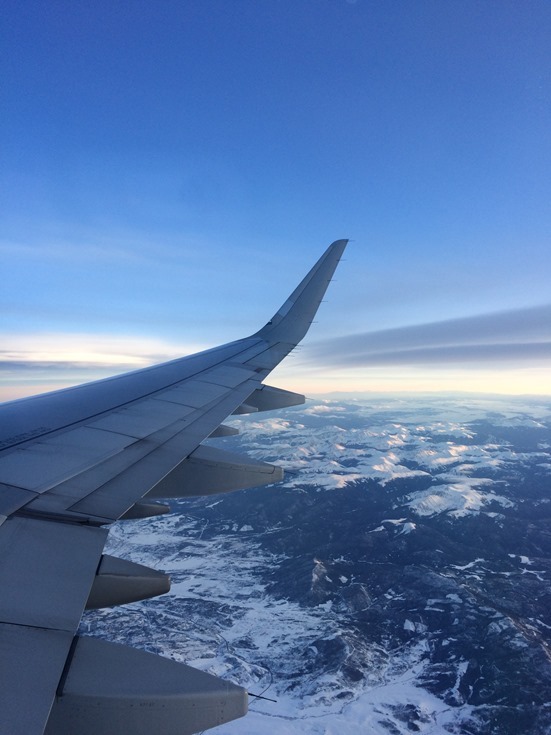 Are you a window seat or aisle seat person when you fly? 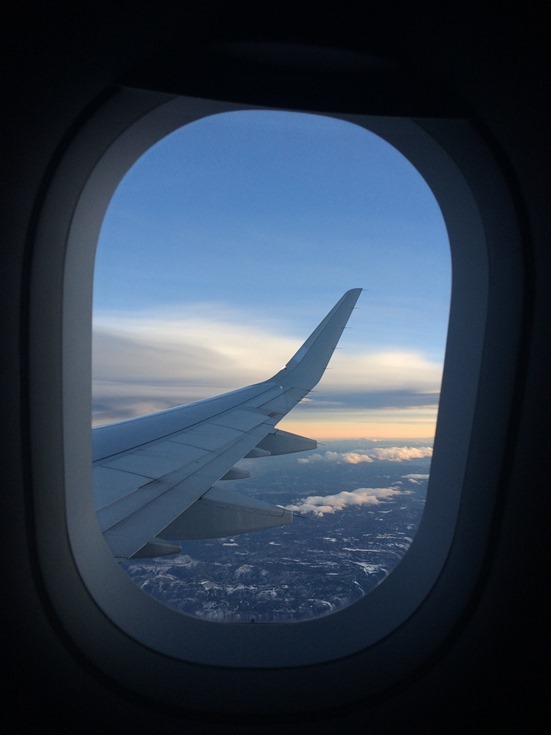 There are advantages of both, but I love sitting in the window seat because of the view. 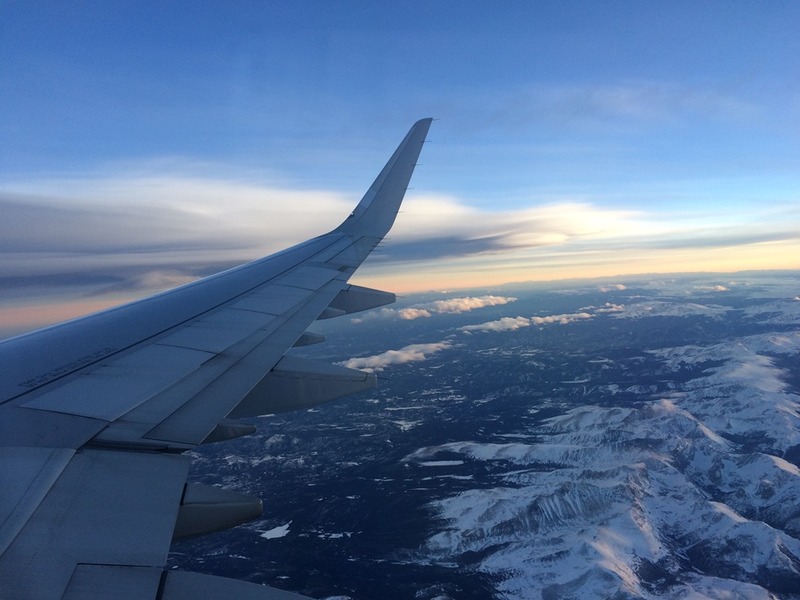 Here are 9 photos that inspire booking a window seat for you next flight. And keep that window shade open! As a flight attendant I see so many people missing a beautiful sunset, gorgeous snow-capped mountains, fascinating lightning storm, and more because they leave their window shade closed the entire flight. 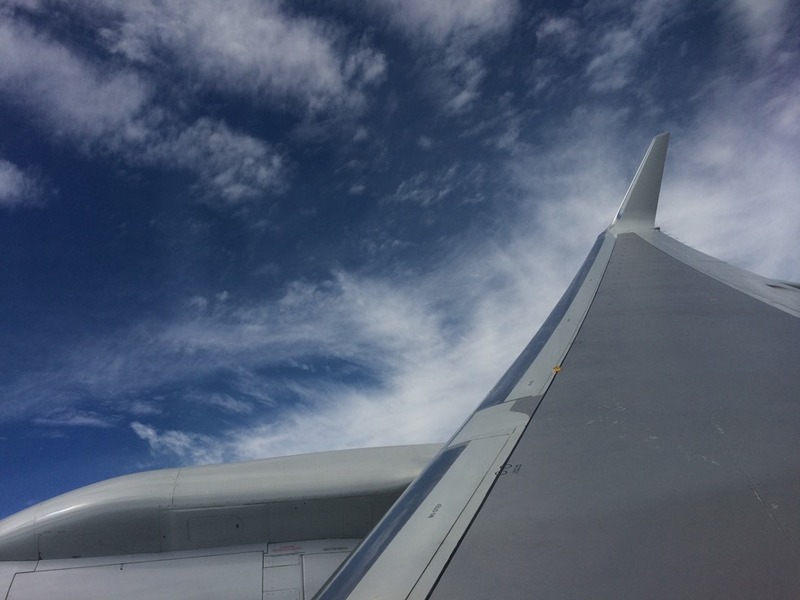 Even if it’s a bright sunny day, just lift the window shade up for a little peek every once in a while to see if there’s a spectacular scene waiting for you. 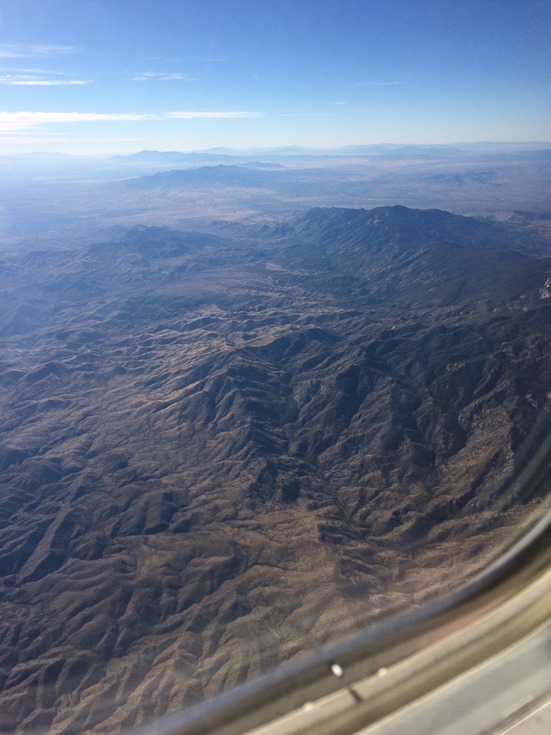 Many of these photos were taken with my iPhone5s, so the quality could be better, but hopefully you can look past that and be inspired by the beauty seen from 30,000 feet. The St. Thomas Airport runway is in the top right corner. Searching for a family friendly hotel? Today I was in a discussion with other family travel bloggers about what amenities or designs we look for in a hotel. The conversation inspired me to list items that are important to me when I travel with my family. When you’re comparing hotels, look for these things for a more family friendly stay. Especially when your children are very young and sensitive to light. When traveling the kids might be going to bed later than usual, so you don’t want them waking at the crack of dawn! PACKING TIP: I usually bring a few clothespins or plastic clips to keep any light from seeping through. Clothes hangers with clips also work. Some kids can handle showers at a young age, but for many it’s just much easier to bathe than shower a young child. It sounds silly, but I get excited when there is a large bathroom in our hotel room. The reason? I often have to hide away there in order to read or work on the computer without disturbing the kids. If there’s a hint of light or activity in the room then they’ll never go to sleep! When you have several people sharing a room it’s so useful to be able to use the sink even when someone is showering or using the toilet. I hate having to move hotel furniture around to create sleeping space for the kids! If you’re traveling with a child under 2, then bringing a travel crib can really help to give your child a better night (and nap) sleep. We love the Baby Bjorn Travel Crib. It sets up in just about 20 seconds and the mattress rests on the floor, with a liner but no bars under it. This makes it so much more comfortable compared to a Pack ‘n’ Play. My son John just turned 4 and he still wants to sleep in the Baby Bjorn Travel Crib! We still used it for him until he was 3.5, because he didn’t try to climb out. He couldn’t stretch out in it, but he loved to scrunch up against the side like it was a hammock. When you have a refrigerator in your room you can stock a few snack items to keep your kids happy between meal opportunities. We usually stock milk, cheese sticks, and yogurt. The reason I personally like having a microwave is to make coffee! Although it’s a nice amenity to have a coffee pot in the room, I never really trust the cleanliness of it. I like to travel with Starbucks VIA Instant Coffee so that I always have a consistent brew. With a microwave I can heat up water, add my coffee packet, and I’m happy! If you know in advance that there is a microwave in your hotel room then you can bring along a few packets of microwave popcorn, reheat restaurant leftovers, or heat up a frozen burrito or something if the kids are going to bed early and you don’t want to pay for room service. It’s nice any time something is free, but when traveling with family, free breakfast in the hotel is especially useful. Your kids may wake up at varying hours, making it difficult to plan a specific time for breakfast. If free breakfast is provided it will save you money going out to a restaurant every morning, plus there is usually enough variety to make even the pickiest eaters happy. At our favorite hotel in Newport, R.I., The Jailhouse Inn, I can leave the kids sleeping in the room (while listening on the baby monitor I bring along) and set up a tray with breakfast for us all. That way if they actually sleep in late, I don’t miss the breakfast hours. 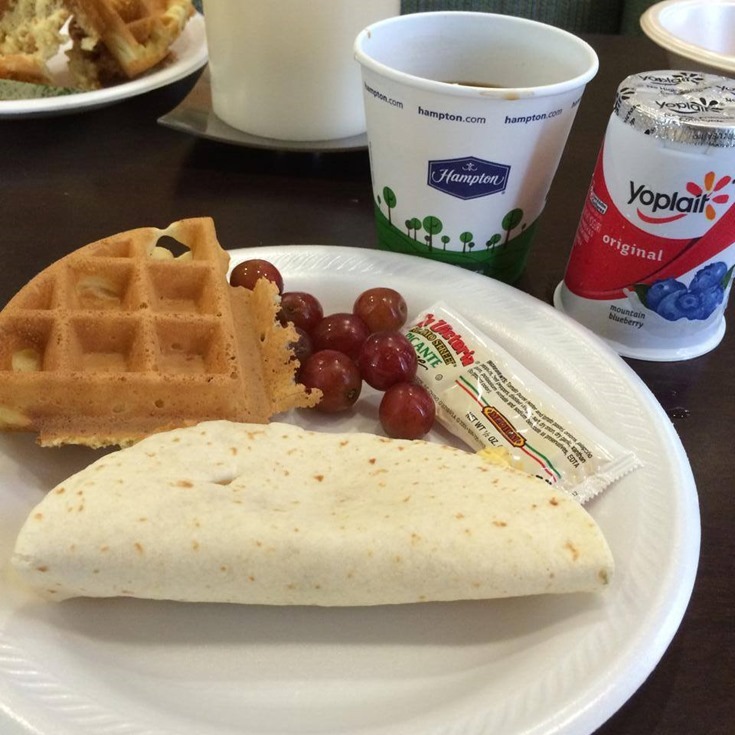 Most hotel breakfasts offer enough variety to make everyone happy. These aren’t things I would actually ask about when booking a hotel, but they might be the thing that wins me as a loyal customer on future visits. Power outlets are such an important commodity! I wouldn’t actually search for this when looking for a hotel, but when a hotel has lots of accessible power outlets it sure makes me happy! When you’re unsure of the setup in your hotel room, you might want to think about packing a small, lightweight power strip so that you’re always prepared. 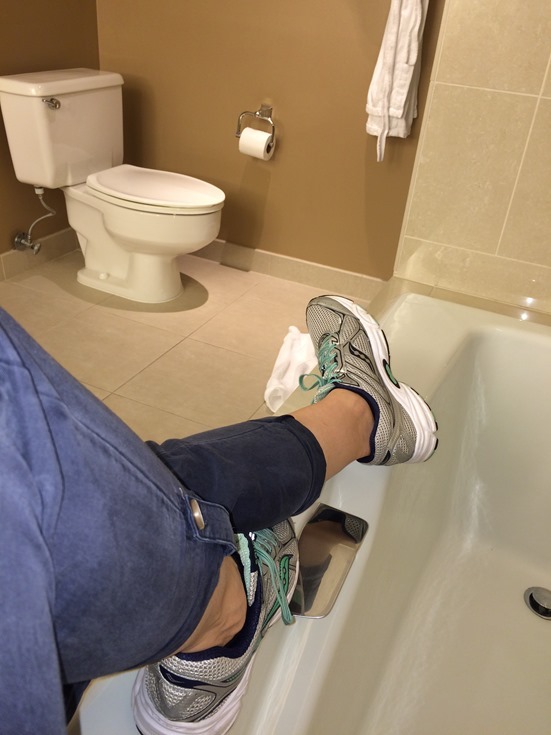 Without a stool, what other creative things have you used to help your child reach the sink in a hotel room? If there is a shower head nozzle it is just so much easier to rinse your child’s hair. Pouring water from a cup only works for a few years before their hair gets too thick for it to rinse well. 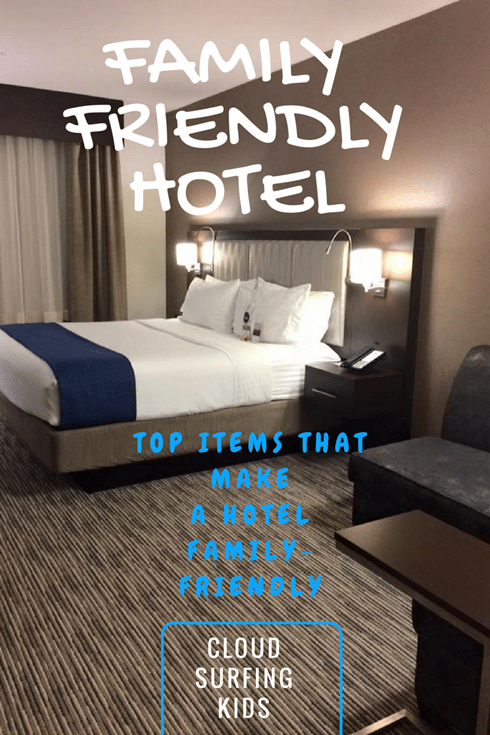 What family friendly things do you look for when booking a hotel? Are the same things that I listed important to you? I love to hear from my readers. Comment below or on Facebook, Instagram, and Twitter. 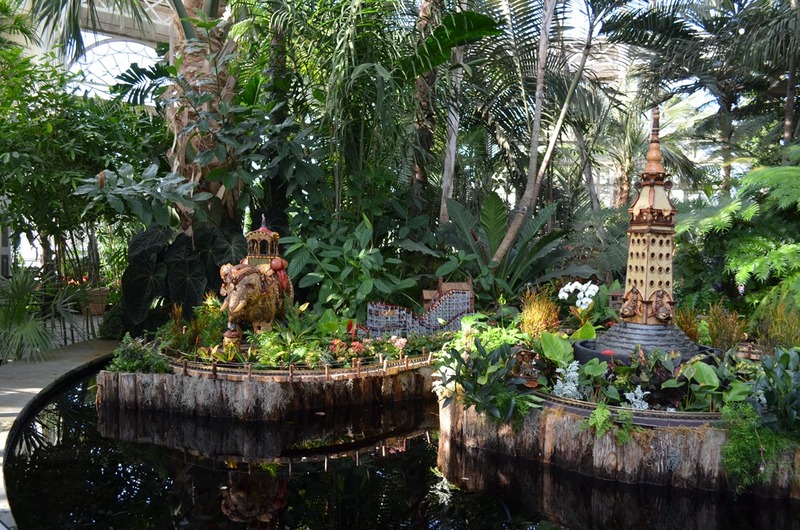 This past weekend we visited the New York Botanical Garden (NYBG) Holiday Train Show. We were lucky and won tickets through our local Macaroni Kid organization (a great resource to discover events and resources for families). The NYBG Holiday Train Show ran from November 19, 2016-January 16, 2016, so it is over for this season. 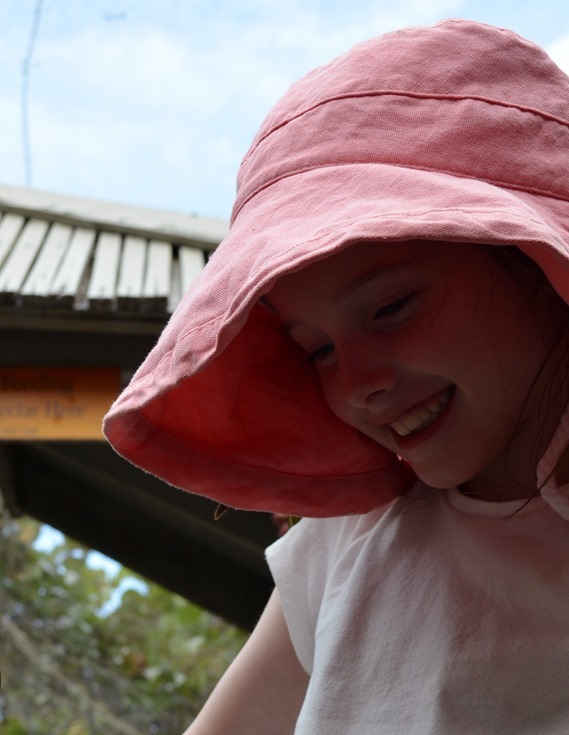 But my daughter, Ella, age 8, would like to share about her experience. 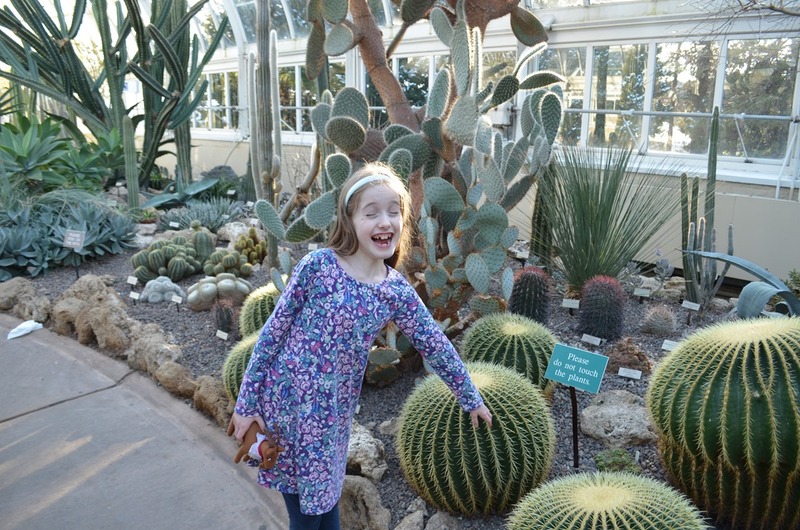 You’ll see from her report that it is still worth visiting the New York Botanical Garden, even when the train show is not on exhibit. 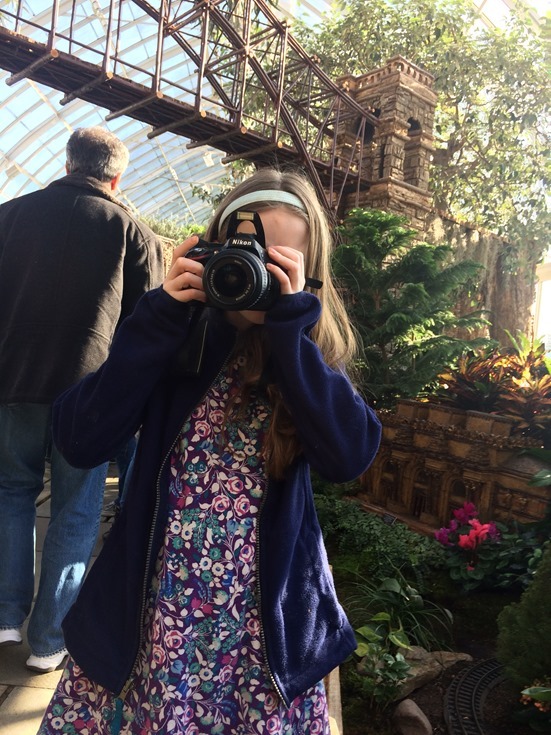 Tip: Giving your kids the camera can help you see even more through their eyes! 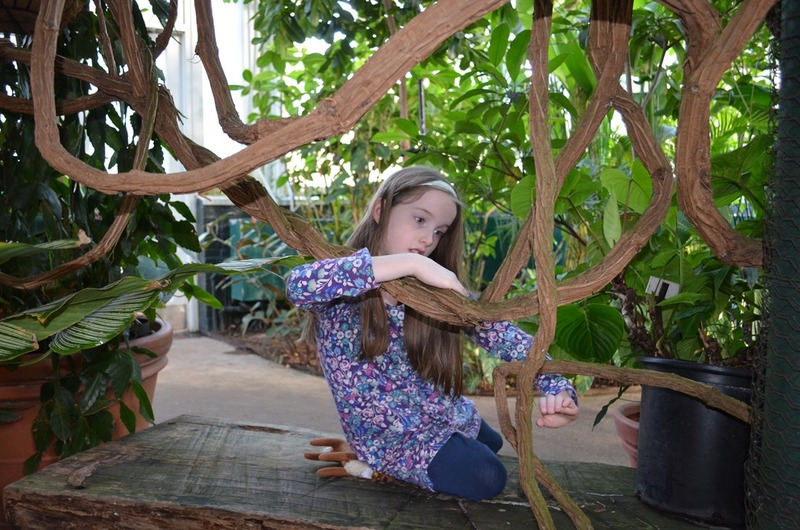 Ella: They make all the houses out of things in nature. It’s really cool. I wonder how long it takes and how they keep it from molding or turning into dirt? I don’t know if I’d like to make one of those. It’s a lot of work, but maybe I would like to do it. The train part of it was good. My favorite part was Coney Island, where the trains were made out of salt shakers and cooking things like that. And trees and acorns and things for decoration. 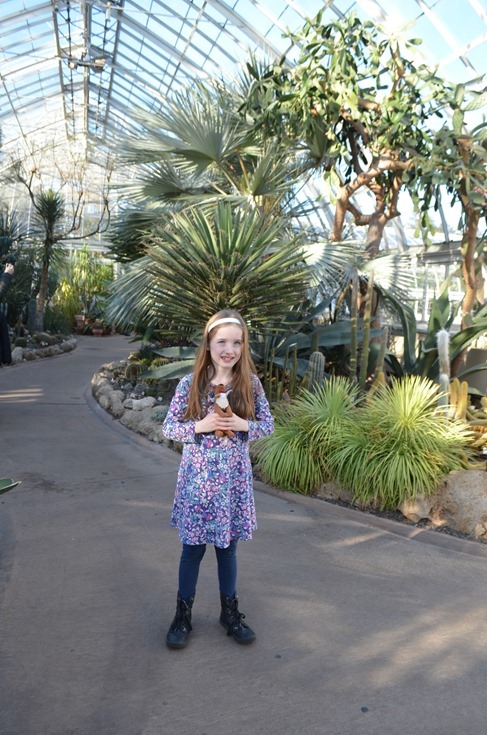 Ella: My very favorite part of the exhibit was the rain forest because it was hot and green and amazing. There was some water there. I wish they added fish, butterflies, and birds to it…maybe monkeys too. Or maybe even frogs. Well, I really liked the jungle section and I went there twice. Beth: If you went back, would you go to the rain forest first? Beth: Would it be worth waiting in line? Ella: Yes, especially if they added some cool animals to the biomes! Ella: These vines are really cool. I was trying to get unstuck from the vines. Ouch! Don’t worry, I wasn’t really touching the cactus! 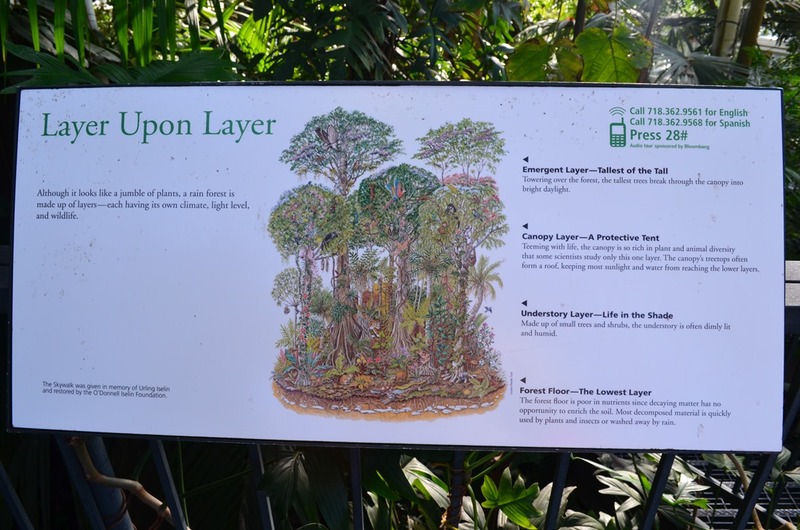 Beth: Would you recommend everyone visit the New York Botanical Gardens? Beth (rephrasing): Would you want them to plan a trip to the New York Botanical Gardens when they can fit it into their schedule? Ella: Yeah. 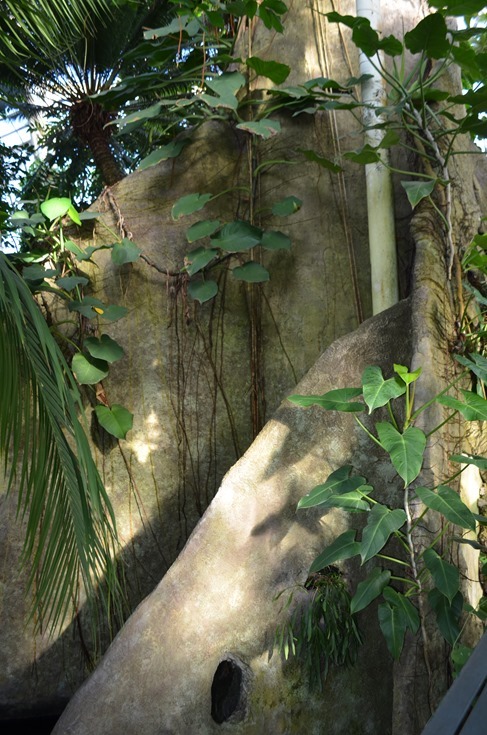 Because it has lots of very amazing plants. 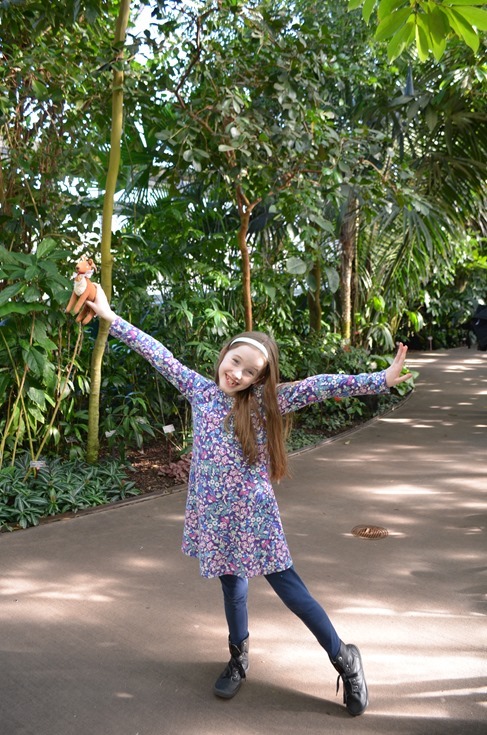 Do you have any questions for Ella about her day the the New York Botanical Gardens? Post below in the comments or on our Facebook, Twitter, or Instagram pages! You can also follow Ella’s artwork on Facebook at EllaJoyArt. Comments will help her want to write and share more, so please take a moment to encourage her. When you’re preparing for an island vacation, you might want to pack some things you don’t pack for every trip. 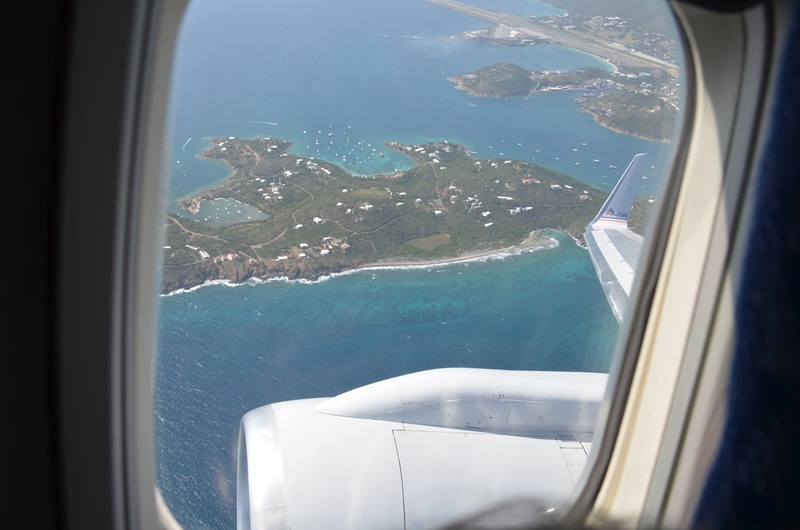 Here are the extra things we pack for our annual island vacation to St. Thomas, USVI. Save yourself money and hassle by bringing these things with you. Many times when we have stayed in St. Thomas, we have experienced power outages which sometimes last for hours. Electricity availability is limited with challenges in supply. Although it has improved in the past couple of years, we always expect to lose power at least once in a week-long stay. I found these Electcity Lanterns, which are light weight (10oz.) and are very bright. I also pack a headlamp flashlight no matter where I travel. Of course there is plenty of food available in most vacation spots, but it is so much more expensive. For the kids I usually pack a few basics if I have room in my checked baggage. I pack peanut butter and jelly, juice boxes, tortillas, macaroni and cheese boxes, dried fruit, a box of favorite cereal, and snack crackers. Depending on your location you might also be able to order some of these online ahead of time and have them delivered. You would expect that a resort or condo at the beach would have sand toys, but some do not. Come prepared by packing a collapsible sand bucket and a few digging tools. If you want to enjoy snorkeling, it is essential that you have a good mask that doesn’t leak. The first time I went snorkeling I had a choice of a few snorkel masks to borrow, but none of them sealed properly. I had to pay about 30% more than retail to buy a snorkel mask that worked for me. I love the idea of this Aikeli mask with no-mouthpiece, which looks easier for kids to manage than a standard mask. You’re visiting the Islands for the sun, but that bright sun might not be so welcome when you’re trying to sleep, especially if you still have young children that need to nap. I pack a couple of lightweight blackout curtains and some clothespins for hanging them. Alternatively you could bring black garbage bags and painter’s tape. Those are my “extra” items for an island vacation. Are there extra items you pack for an island vacation that you don’t pack on other trips? Share in the comments below! Every Tuesday I write a new blog post with travel tips. Be sure to follow on Facebook, Twitter, or Instagram! If you have any travel questions I’d love to help! As I was packing last week I finally recognized my method. Here, in 5 simple steps, is how I pack when I’m flying with kids. Check back every Tuesday for a new Travel Tips post. And I love to have new followers! Find me on Facebook, Twitter, Instagram, and Pinterest. Select the clothing items you think you’ll need for each person and set them out on your bed. From the clothing you’ve selected, find a travel outfit for each person and an outfit for a spare. Put the spare outfit, complete with socks and underwear, into a gallon-size Ziploc bag: one for each person, two for babies. I almost always set out more than I need. Consider whether you will really wear each outfit. Take items that can be used to dress up or down. If you’ll be able to launder your clothing then you can pack less. 4) Pack Toiletries and Medicines. I love this refillable bottle pack. I’ve never had them leak and the sizes are within the TSA acceptable guidelines. (Remember that when bringing liquids with your carry-on bags you must comply with TSA guidelines: 3.4 ounces (100mL) or smaller containers, all stored within a Quart-sized Ziploc bag. One bag is permitted per ticketed passenger. Medicines are exempt from this size restriction but must be separated and declared for separate screening.) Don’t pack necessities like medicines, glasses, mouth guard, or keys in your checked bags; always put them in your carry on. Some of the food items I always pack are food bars, dried fruit, sandwich crackers, and cheese sticks. You can find more travel food ideas here: Fun Travel Food and Tools, Food on the Plane: What Can I Bring?, 5 Homemade Travel-Friendly Foods. If you need ideas for activities and toys to keep the kids occupied in flight, try a few of these: Busy Bag for Preschoolers and Elementary Age Kids to Share; Unique Travel Toys for ages 3-6 (and up); Best Travel Gifts for Toddlers. Does this list help you? Would you add anything to it? Comment below! Your comment may help other travelers perfect their packing methods.